It’s been a while since I posted a cooking or baking post. I’ve been sticking to the tried and true and not branching out as much. Well, no more! This is one of those whatever-was-at-hand-is-what-I-used sort of experiences. I based it roughly off of this recipe, but I put my own spin on it (by using ingredients left over in my fridge/around the kitchen). Preheat the oven to 400˚F. 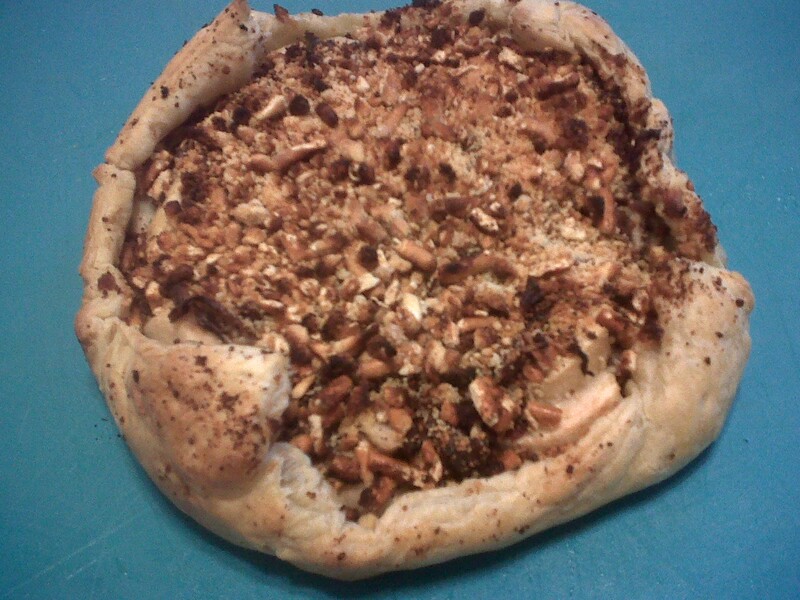 Grease or spray a non-stick baking tray and place the pastry sheet on it to thaw. 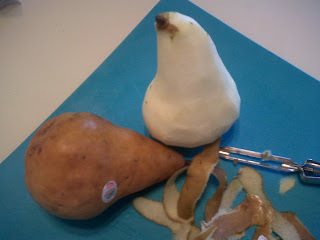 Peel and cut up pears, set aside. 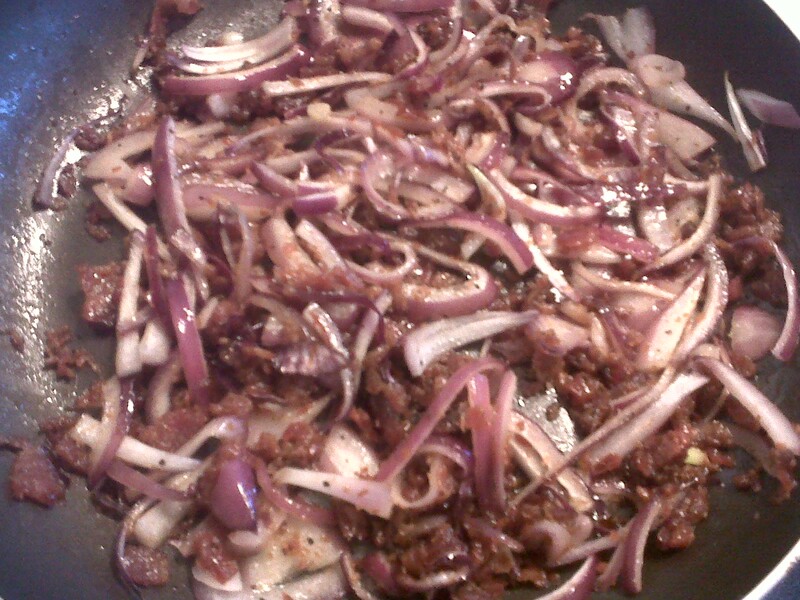 In large saucepan, sauté sliced red onion in oil on medium high heat for 3 minutes. 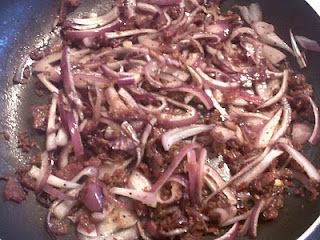 Add bacon, honey and hot sauce to mixture, and continue to heat, stirring for another 3-4 minutes or until onions are caramelized and golden brown. After unfolding thawed pastry sheet, place sliced pears in a single layer, leaving at least one inch on all sides. 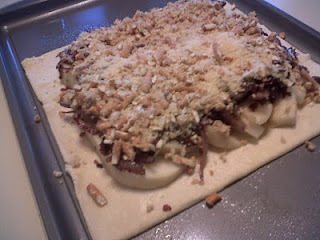 Spread onion bacon mixture over the pears. 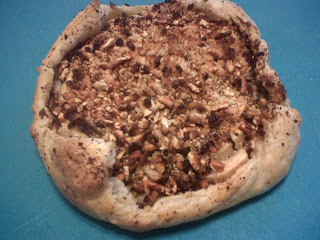 Cover with topping (see below), and then fold up edges to create a crust, pinching dough together to make it hold. Bake 25-30 minutes, or until topping browns. Let cool at least 5 minutes before serving. Mix crumbled pretzels (or substitute), cheese, hot sauce and honey in a small bowl until combined. Season to taste. I searched the internet and found a recipe that used the ingredient combination that I wanted. What I forgot it that sometimes my little ‘improvements’ don’t always make for the most delicious food possible. While this turned out to be pretty and ultimately palatable, if I were to make the recipe again, I’d switch out Parmesan (too pungent) and I’d exchange pretzels for breadcrumbs. I think with Gruyere and without all the extra salt from the pretzels, this could well become a favorite recipe. My roommate liked it; she told me that she kept thinking the pears were chicken pieces. The Bosc type was a great choice – the flesh stays firm and is flavorful at the same time. I think if the topping were a bit more cohesive (read: the cheese were different), this would have a lot of the same texture as pizza. It looks fantastic! I like it! Soooo yummy looking. You should check out what Corey made for dinner on my FB. I might try this with cotija (er, the tajo type, not the montana, which would probably be too salty). Very similar to Parmesan, but I prefer it for cooking. Although, while quite different, I do love to use bleu cheese with fruit, and it tends to bake well . . .
Also, I only have agave nectar around the house. I left my honey behind because it would be a hassle to move. :( But it might work okay . . . probably not. Did you use clover honey? I like the taste of wildflower honey, myself. But I've been meaning to buy some chesnut honey, which is supposed to impart a bit of a bitter flavor in balance with the sweetness. 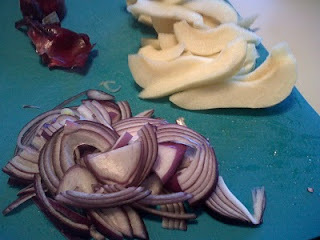 It might be a good tone with a savory-sweet dish like this.
. . . I miss having my own kitchen. You combined three of my favorite things on the planet. How could I not want it.